We discussed how to dispose LiPo batteries, but we still haven’t touched on when we should throw them out. So in this article I are going to talk about how I determine if a LiPo battery should be thrown away. 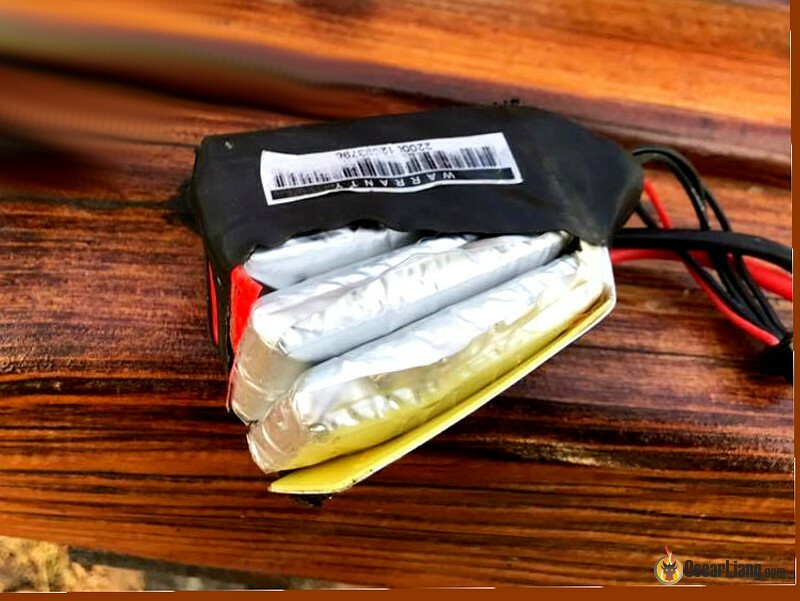 If you are lucky enough not to break your LiPo battery before its end of days, it should have an average lifespan of about 400–500 cycles. One cycle means a battery being fully charged and then discharged. Of course this also depends largely on factors like how much “abuse” you put your batteries through, and how you handle them on a daily basis. LiPo batteries don’t have an expiry date printed on them. But from my personal experience, I did find new batteries perform better than old batteries, even when they just sit there and not being used much. I generally find batteries that are 12- to 18-month old to show noticeable drop in performance. I would probably replace them no more than two to three years even when they might look completely normal on the outside. That’s just me, other people might have different opinions. It’s helpful to label and date your battery packs when you first get them in from shop. One useful battery health indicator would be internal resistance (IR). As explained in my LiPo battery guide, IR determines how effectively the battery can deliver the current to your quadcopter. High IR means lower performance, and more heat generated during charging and discharging. 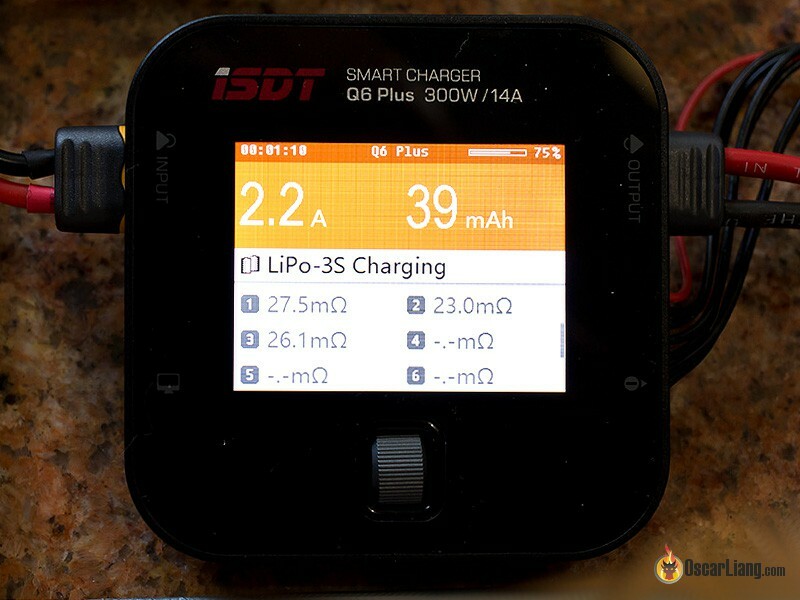 IR can be measured with most LiPo chargers these days (for example the iSDT Q6). You get shown the data every time you charge it. The IR depends heavily on the size of the cells. Larger cells will have inherently lower IR (that’s why when you parallel charge, the IR will appear lower than when you charge those batteries separately). For typical 1300mAh to 1500mAh packs, I would consider under 10mΩ to be great condition, 10mΩ to 20mΩ to be fine, 20mΩ to 30mΩ to be old, and over 30mΩ to be “time to retire”. Note that there are many other factors that can affect your IR readings, for example, measuring equipment, temperature and stage of charge. To accurately measure IR, make sure the pack is fully charged, and at room temperature (e.g. 20°C). New batteries should have a relatively low IR. But if you bought some new batteries from unknown vendors and IR turns out to be very high, it’s probably because these don’t have good C-Rating. If one of the cells has noticeably higher IR than other cells’ (e.g. 100% higher), it’s probably not safe to use and I’d personally throw it out. When this happens, you might find this cell not holding its voltage very well: voltage is way lower than other cells after a flight and charging. A visual examination of your LiPo battery can help you determine if it should be replaced. 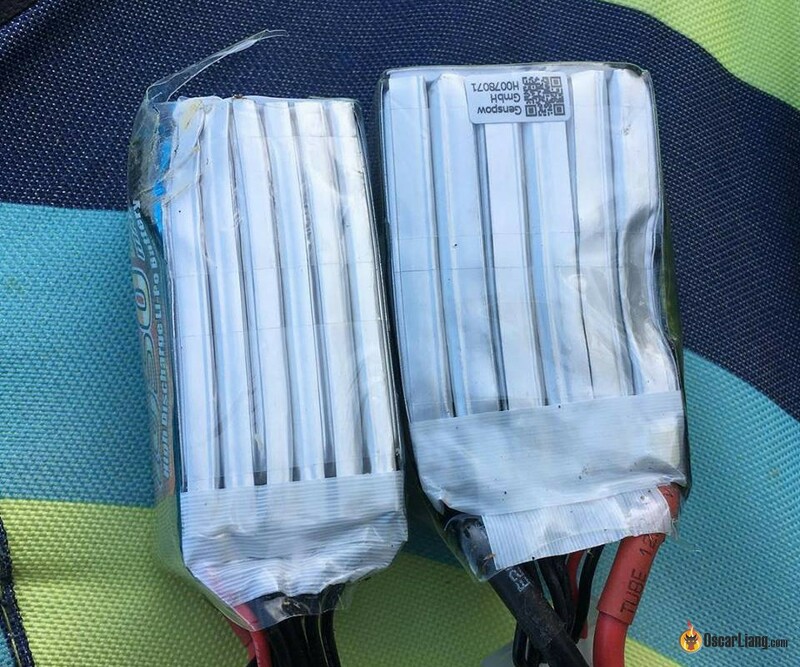 LiPo batteries used on drones can become deformed in a crash since they are exposed on the outside of the frame. Some people take the risk carry on using these dented batteries without much of a problem. But the risk of fire increases so I’d personally just dispose them. Your batteries can also become “puffed” after some abusive uses or they are just simply getting too old. Perhaps it’s not as bad as the one in the picture below, but you might notice it’s getting fatter than it was, this is a sign of puffed/swollen LiPo. It’s pretty normal that the cell voltages are slightly different after a flight, maybe one is at 3.55V, one is at 3.59V, and another at 3.61V… The point is, they should all be within reasonable range. You should be cautious when the gaps grow. When the internal resistance of particular cells are higher than others, they discharge slower and therefore have a higher voltage remained at the end of the flight. Eventually this might lead to over-discharging of other cells in the battery and cause swelling. This is also why you should always “balance charge” your batteries in case of over-charge. If you noticed any of these problems, then you should consider replacing the battery, unless you don’t mind the decreasing performance. Another thing to keep in mind is the temperature of the LiPo after a flight. If a battery is getting way hotter (can’t hold it in your hand for more than 10 seconds) than others, it’s also a sign of getting old. If your battery gets warm during charging, then it’s an extremely important sign that your battery might have a problem. LiPo batteries shouldn’t get noticeably warm when charging at reasonable rate i.e. at 1C or even at 2C. People ask me this at least twice a month. But would you risk your house over a damaged $25 Lipo battery? I just crashed my fixed wing into the ocean. I had a brand new Lipo on for its first use as well, is my battery toast? How to know at what IR is time to drop the battery? It depends on how much you can tolerate the decrease in performance :) you can continue to use it if all the cells are within similar range.